How does one go about purchasing web hosting, and what needs to be considered before committing to a web hosting service? Also, what happens when you buy web hosting? What do you need to do to get your website on your feet? This article, with the help of our evilest Sith and greatest Jedi, will answer all of your questions. 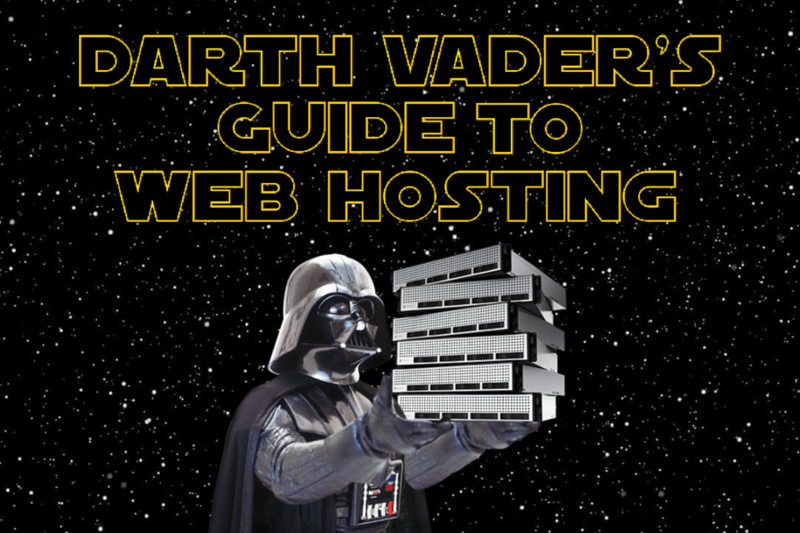 Like someone who hasn’t watched Star Wars and doesn’t know what a Jedi is, you may or may not know exactly what web hosting is, so the best thing to do is to watch the movies… Or rather, right now, research what web hosting is all about. There are tons of websites and articles dedicated to defining web hosting, especially on our own Crucial Broadcast — check out our Web Hosting School infographic for a quick lesson on web hosting. Summary: Research what web hosting is all about and what services are provided. Do you have a business that needs to be found online, or moved online? Do you want to start an e-business: in products/services? Do you want to create an informational website (for what Wikipedia doesn’t have)? Do you want your say on things, with a blog? Do you want to create a community website, for a certain community, organisation, or group? Summary: Decide on what you want to do with your web hosting. You don’t want to get caught off guard with hosting that you didn’t want, or with features that you don’t need. One thing is to research web hosting, but another is to understand what hosting features are offered from web hosting businesses. Some examples that you can research are RAM, CPU cores, data storage, bandwidth, etc. You should also understand the different types of web hosting services offered, i.e. standard web hosting, reseller hosting, VPS (virtual private server) hosting, email hosting, and so on. Summary: Understand the features of offered services. Once you understand what web hosting services offer, start thinking of what you actually need from the service. As an exercise, write down all of the features that you would like to get from your hosting service — basically, create your ideal web hosting package. Do you want a control panel? Managed services? Data backups? DDOS Protection? 24×7 support? Green hosting? A low price? No lock-in contracts? Australian servers? Summary: Plan out what you need from a web hosting service. Now that you know what you want/need, get out there and find the manifestation of your ideal web hosting service, or, at least, find the one that resembles it closest. There are a lot of web hosting businesses all over the world, and a few key competitors in Australia. So, utilise Google to the best of your ability, and search away to find your ideal service! Summary: Dig around to find which competitors offer your desired features. Then, settle for your best fit. Some people buy web hosting, but never have the time to do anything with it, or just aren’t willing to spend time on it. Some simply don’t think that they can go through with making something out of it. I was one of them — I signed up for web hosting with a great idea, but never really developed or stuck to it. My advice is: don’t think that you can’t do it, be positive and think that you CAN do it. Sculpting something out of your web hosting may be a simple task for some, but weary for others, but as long as you’re passionate, patient, and persistent, you’ll have no trouble. Summary: Passion, Patience, and Persistence are key to making something out of your web hosting. Like everything, practice makes perfect. Explore the open world of the website builders that come with your web hosting service, which is popularly WordPress. Discover a wide range of website templates and modify your website to your heart’s content. Understand what you need for your website, depending on what it’s used for: e-business sites need to cater to the customer purchasing products/services, whereas blogs need to cater to a reader becoming engaged. Summary: Plan out what you need for your website, and then create it with a website builder. Every website needs marketing, regardless of its content. What you’ll need to do, in order to stay ahead of the curve, is to develop and implement an online marketing strategy for your website. For e-businesses, the first step is to refer to the basics of any marketing strategy — the 4 P’s: Product, Price, Place, and Promotion. Though, what we’re going to be focusing on the most is the last one, Promotion — because you should really already have your product(s), pricing strategies, and how you’re going to distribute them. Understand who your target market is — who would want your product(s) the most? Who would benefit the most from your product(s)? Don’t just think about demographics of certain populations (like age, gender, location, etc. ), but also think outside the box, what are their behaviours, likes/dislikes, lifestyles? Decide which media vessels are the most appropriate fit for your target market — social media is an important consideration. Is a blog going to be effective in communicating to your audience? Consider online advertising, through Google AdWords, social media sites, and other ways. Summary: Don’t forget what you’ve set out to do; develop and stick to your strategy. Poor (or no) communication means that important information doesn’t get conveyed. Online, everything is about communication. You need to get your website communicated to your audiences, and one of the best ways just may be social media. It’s going to be your best friend in your promotion efforts, mainly because it’s very effective and also free. Summary: Social media is a must have in your promotional efforts. Once you set up your social media profiles for your website, you then need to create content to post — even if it’s just a reminder that you’re up and running. After you’ve created the content, you need to find the right times to post them (which can be done with a Google search, or social media sites ‘Insights’ or ‘Analytics’ tools), and create a schedule of what content to post on which social media sites, and at what times. We wrote an article a while ago that details everything that you need to do to create a successful social media strategy; you can access it here. Summary: It’s one thing to stick to your strategy, but don’t forget to develop and stick to your content posting schedule.